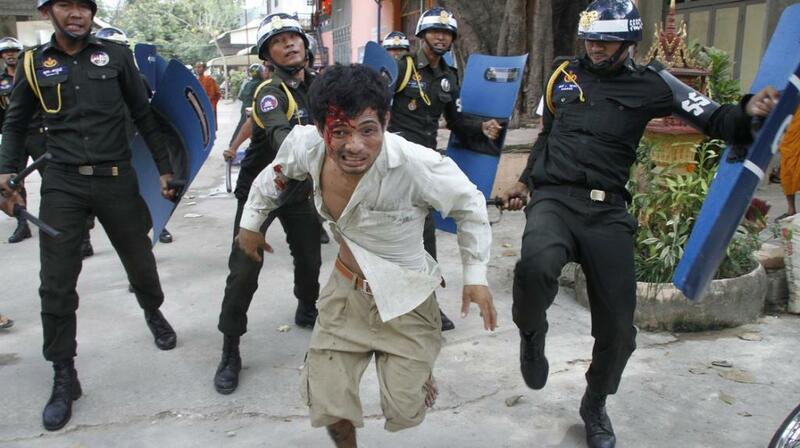 Protesting garment workers in Cambodia have clashed with police leaving scores injured. Workers employed at SL Garment processing – who make clothes for Nike, H&M, & Gap - marched on the Prime Ministers house, demanding better pay and working conditions. They were met by heavily armed police who were intent on violence, using live bullets and tear gas to disperse the marchers. A woman selling rice at the side of the road was shot and killed by the indiscriminate shooting of the security forces. Many eyewitnesses and journalists report seeing the police rounding up and attacking anyone and everyone in their path - including, people not involved in the march, street sellers, and praying Buddhist monks – who responded by pelting the police with bricks. The Cambodian garment industry employs more than 500,000 people and is the largest sector in the country’s economy, accounting for over 80% of GDP. Many of the factories are owned by foreign multinationals who threaten to leave the country and set up elsewhere when workers demand better wages – similar to the situation in Bangladesh. Poverty wages, no health and safety, and child labour are commonplace. The Prime Minister has said that protests may imperil the country’s garment industry by encouraging companies to move their businesses to Myanmar, Laos, and India, where the cost of labour is even cheaper. Hopefully garment workers throughout the region will start to link up their struggles. Solidarity with all those involved.